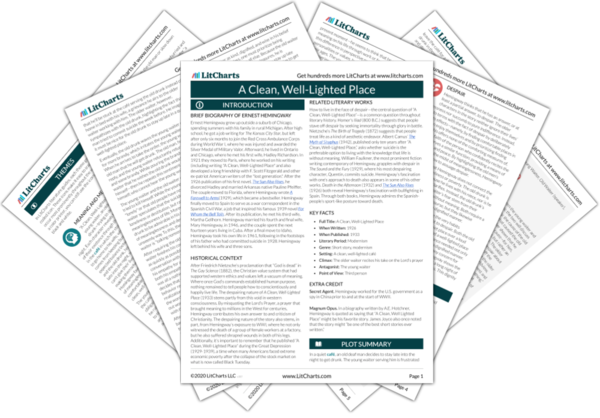 Instant downloads of all 946 LitChart PDFs (including A Clean, Well-Lighted Place). Welcome to the LitCharts study guide on Ernest Hemingway's A Clean, Well-Lighted Place. Created by the original team behind SparkNotes, LitCharts are the world's best literature guides. A concise biography of Ernest Hemingway plus historical and literary context for A Clean, Well-Lighted Place. A quick-reference summary: A Clean, Well-Lighted Place on a single page. In-depth summary and analysis of every of A Clean, Well-Lighted Place. Visual theme-tracking, too. 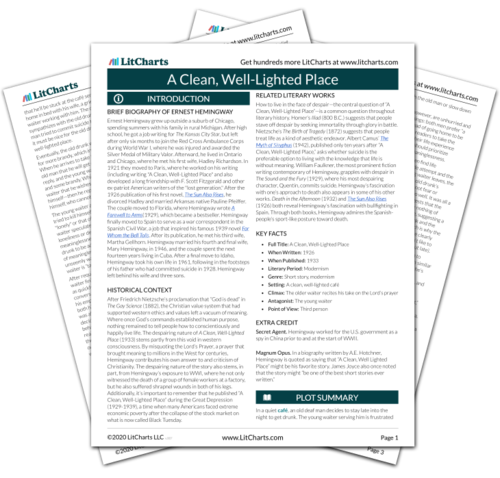 Explanations, analysis, and visualizations of A Clean, Well-Lighted Place's themes. A Clean, Well-Lighted Place's important quotes, sortable by theme, character, or . Description, analysis, and timelines for A Clean, Well-Lighted Place's characters. Explanations of A Clean, Well-Lighted Place's symbols, and tracking of where they appear. An interactive data visualization of A Clean, Well-Lighted Place's plot and themes. Ernest Hemingway grew up outside a suburb of Chicago, spending summers with his family in rural Michigan. After high school, he got a job writing for The Kansas City Star, but left after only six months to join the Red Cross Ambulance Corps during World War I, where he was injured and awarded the Silver Medal of Military Valor. Afterward, he lived in Ontario and Chicago, where he met his first wife, Hadley Richardson. In 1921 they moved to Paris, where he worked on his writing (including writing "A Clean, Well-Lighted Place" and also developed a long friendship with F. Scott Fitzgerald and other ex-patriot American writers of the "lost generation." After the 1926 publication of his first novel, The Sun Also Rises, he divorced Hadley and married Arkansas native Pauline Pfeiffer. The couple moved to Florida, where Hemingway wrote A Farewell to Arms(1929), which became a bestseller. Hemingway finally moved to Spain to serve as a war correspondent in the Spanish Civil War, a job that inspired his famous 1939 novel For Whom the Bell Tolls. After its publication, he met his third wife, Martha Gellhorn. Hemingway married his fourth and final wife, Mary Hemingway, in 1946, and the couple spent the next fourteen years living in Cuba. After a final move to Idaho, Hemingway took his own life in 1961, following in the footsteps of his father who had committed suicide in 1928. Hemingway left behind his wife and three sons. 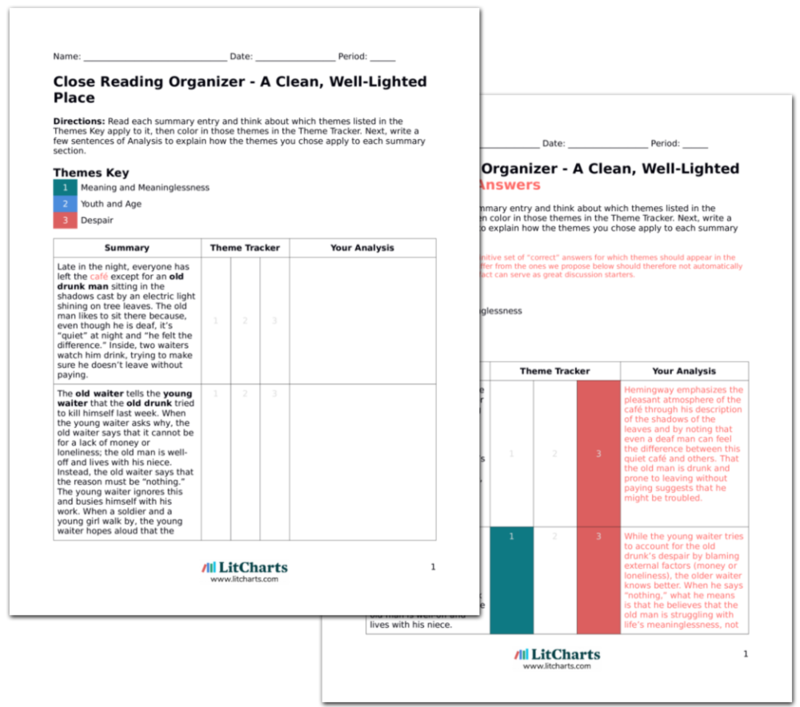 Get the entire A Clean, Well-Lighted Place LitChart as a printable PDF. After Friedrich Nietzsche’s proclamation that “God is dead” in The Gay Science (1882), the Christian value system that had supported western ethics and values left a vacuum of meaning. Where once God’s commands established human purpose, nothing remained to tell people how to conscientiously and happily live life. The despairing nature of A Clean, Well-Lighted Place (1933) stems partly from this void in western consciousness. By misquoting the Lord’s Prayer, a prayer that brought meaning to millions in the West for centuries, Hemingway contributes his own answer to and criticism of Christianity. The despairing nature of the story also stems, in part, from Hemingway’s exposure to WWI, where he not only witnessed the death of a group of female workers at a factory, but he also suffered shrapnel wounds in both of his legs. Additionally, it’s important to remember that he published “A Clean, Well-Lighted Place” during the Great Depression (1929-1939), a time when many Americans faced extreme economic poverty after the collapse of the stock market on what is now called Black Tuesday. How to live in the face of despair—the central question of “A Clean, Well-Lighted Place”—is a common question throughout literary history. Homer’s Iliad (800 B.C.) suggests that people stave off despair by seeking immortality through glory in battle. Nietzsche’s The Birth of Tragedy (1872) suggests that people treat life as a kind of aesthetic endeavor. Albert Camus’ The Myth of Sisyphus (1942), published only ten years after “A Clean, Well-Lighted Place,” asks whether suicide is the preferable option to living with the knowledge that life is without meaning. William Faulkner, the most prominent fiction writing contemporary of Hemingway, grapples with despair in The Sound and the Fury (1929), where his most despairing character, Quentin, commits suicide. Hemingway’s fascination with one’s approach to death also appears in some of his other works. Death in the Afternoon (1932) and The Sun Also Rises (1926) both reveal Hemingway’s fascination with bullfighting in Spain. Through both books, Hemingway admires the Spanish-people’s sport-like posture toward death. Secret Agent. Hemingway worked for the U.S. government as a spy in China prior to and at the start of WWII. Hughes, Kevin. "A Clean, Well-Lighted Place." LitCharts. LitCharts LLC, 18 May 2018. Web. 23 Apr 2019. Hughes, Kevin. "A Clean, Well-Lighted Place." LitCharts LLC, May 18, 2018. Retrieved April 23, 2019. https://www.litcharts.com/lit/a-clean-well-lighted-place.